In today’s post, I want to share my top five reasons to be an Army National Guard Recruiter. These are good reasons to sign up for the recruiter program. Please note these are the things that I like most about the program. They are listed in no particular order. Most of the National Guard Recruiters I’ve met make their own schedules. They don’t have the traditional schedule that most Soldiers have. While most recruiters put in LONG HOURS six or more days per week, they do have some flexibility in their schedule. If they need to take time off for a personal appointment they can. 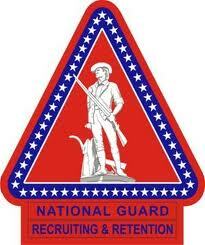 What attracts me most to the National Guard Recruiter Program is that you can be a free agent. In most cases, you won’t supervise anyone. Yes, you will have a boss, but most of the time will be spent by yourself or with new recruits. And if you are good at what you do, you probably won’t see your boss very often. This is a nice break from supervising Soldiers or having a traditional job and chain of command. Top 5 reasons to be an Army National Guard Recruiter! As a recruiter, you will get Active Duty pay, since you are either an AGR Soldiers or are on ADSW Orders. In addition to that, you will also get a recruiter stipend. I don’t know the exact amount, but I believe it’s an extra few hundred dollars a month. This can help improve your finances each month. Another great benefit of the National Guard Recruiting Program is that you can travel. Sure, you won’t get to travel all over the world. Depending upon your “territory” you will probably get to travel all over the state. You won’t be stuck in the office every day staring at the same computer. You will be out in the trenches, attending community events and visiting places you might not otherwise see. And you will have a government car to travel in. One of my favorite things about the ARNG Recruiting Program is that you will learn “sales skills.” While some people balk at the selling profession, I believe these skills will make you a better NCO, leader and civilian. You will learn communication, persuasion, and the selling process. You will also learn a lot about Army Regulations and Rules. This will “round out” your experience and make you more valuable to the Army. Of course, the National Guard Recruiter Program isn’t all peaches and roses. You will work long hours; have quotas, and some pressure to perform. But, if you like people and you like to sell; this might just be the perfect career field for you. And if you are good at what you do, it’s a pretty easy way to excel your Army Career. What are your thoughts? Do you have any questions? Please post all comments and questions below. Thanks. It sounds like the recruiter job is something that I would enjoy. The ‘sales’ aspect would not deter me at all: in fact, I would love it. It would be a chance to talk to all sorts of people who are on the verge of making one of the most important decisions of their lives. The travel opportunities and the extra pay would of course be welcome also. Setting my own schedule would also be great: I guess this is about as flexible as the service can get. If I would have stayed enlisted myself, I would have been a recruiter. I think it’s a great job, especially if you have good people skills and like to sell. Interesting article and a good read for anyone considering becoming an Army National Guard Recruiter. Being stuck behind a desk and meeting quotas doesn’t sound like fun, but if it’s good pay it probably isn’t all that bad. Also, you constantly get to meet people. I wonder how much you really get to travel though. Do you have any say in where you go? Lots of National Guard recruiters get desk time, but there is also lots of time out in the field. You can go to job fairs, to schools, on appointments, out prospecting, etc. My buddy was a recruiter and he told me he spent about half his time in the office and the other half out of the office. To me, that sounds like a pretty good deal. My career life has found me constantly in the areas of sales, marketing, communications, training, and mentoring. I have found that engineers and other technical careerpersons feel a certain dislike for the other side, but we need both in the world and in the military. We need the thinkers, doers, and sellers. If a person believes in the National Guard and Army and is good with people and intuition and has a superior knowledge of the advantages of being a part of military, he or she will make a great recruiter. I can see a lot of people interested in the travel and not being stuck behind a desk all day. The freedom of not commanding others and meeting with supervisors only on rare occasions also seems like a great perk. Yet, for those of us who do not like sales, the stress of meeting recruitment quotas could be daunting. I don’t think being a recruiter would suit me. I imagine the long hours also includes evenings and weekends, which I think would deter many from becoming a recruiter. I hate sitting behind a desk. The key to doing fun and exciting training in the National Guard is to have leaders that take pride in their job and make the time to schedule tough and realistic training away from the armory. Being an Army Recruiter is a great job and these benefits listed are very appealing. So appealing that a godo friend of mine actually de-commissioned as a LT to become an E5 recruiter! He loves his new position and is working full-time within his hometown. Good for him. It’s important to find something you enjoy! Personally, if I was going to serve again, I could definitely see myself transition from Officer to Recruiter. I love sales and marketing and I love the independence that most recruiters get! Sure, they have a boss, but most of them spend most of their time by themselves or with their prospects. The interesting thing for me is that it’s a temporary billet for active Soldiers, but for the Guard, they want to develop you as an actual career counselor for the rest of your career. While this can lead to complacency for some Soldiers, for most it will develop you as an expert, by the time you make SGM you can hold some positions at state level and affect the entire RRB in your state. Good point. If someone is good at it, I don’t see a problem with them making a career of being a recruiter. The way it’s structured in the Guard, I think it’s necessary for some of them to stick around and commit to doing it. They do need to be vigilant to make sure the recruiters in the field are doing what they are supposed to be doing, though. Especially in remote areas that aren’t by the flagpole, like my town.